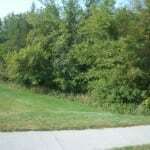 The parks and trails system in North Liberty updated September 2013. Individuals may reserve shelters, green space and baseball fields. To make a request please complete these linked forms and a staff member will be in touch with you shortly. Beaver Kreek Park was open to the public in 1972. Beaver Kreek Park’s name was created by using the developer’s initials, George Buechler and Ralston Kornegor. The land for the park was dedicated to the City of North Liberty as part of the platting of the Beaver Kreek subdivisions developed by Buechler and Kornegor. 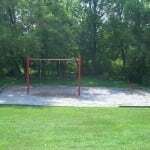 Playground equipment was added in 1972 with the help of a 50% grant from the Iowa DNR Land and Water Conservation (LAWCON) fund. Beaver Kreek Park is located at the end of South Chestnut Street. This 2.9-acre park is an attractive neighborhood park with three pedestrian accesses from Juniper Court, Birch Court and South Hickory Street. This park features a pedestrian bridge and beautiful trees throughout the park. 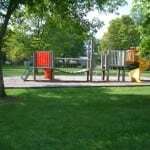 Facilities include a wide variety of playground equipment; a larger basketball court; picnic tables and benches. 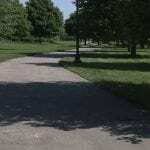 Broadmoor Park & Pond is located east of South Front Street on Broadmoor Drive. The land for this 9.37- acre park was donated to the City by the Broadmoor Estates Subdivision Developer Mike Roberts. The land was accepted by the City on October 14, 2008 although the City has maintained it since 2002. On October 14, 2003 the Parks Department collaborated with the Iowa Department of Natural Resources (DNR) to obtain 3,000 bluegills and channel catfish to stock the pond. During the summer of 2004 the pond received approximately 340 largemouth Bass. In 2006 the Boy Scouts along with Parks Staff completed an Eagle Scout project and planted trees around the park and pond. 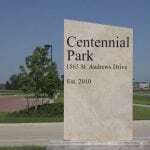 Centennial Park, opened in 2013 on St. Andrews Drive west of Jones Boulevard, is the community’s largest park. It is still being development, but currently includes a stocked pond on its 40 acres of greenspace. The next phases are expected to include on-site parking, picnic shelters, an enclosed pavilion, a band shell, various play features and a splash pad. 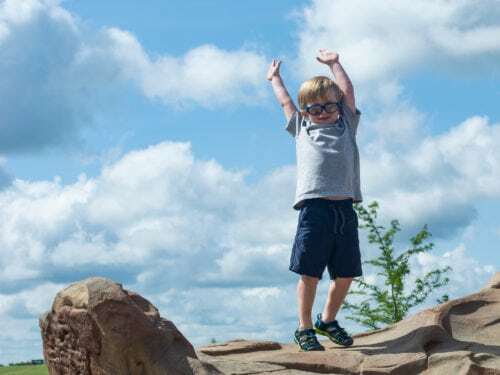 The park was named after council, staff and parks and recreation commissioners chose from more than 300 public suggestions. Cornerstone Park is a 2.44- acre parcel that sits undeveloped surrounded by residential on three sides and commercial on the fourth. Cornerstone Nature Area is located at the intersection of Dubuque Street and Zeller Street and Whitman Avenue dead ends into the property on the North. It was donated to the City October 4, 2008 by Richard Ferguson who wanted the area to stay undeveloped and maintained as a park setting. In October 2008 the City was awarded a $100,000 DNR REAP (Resource, Enhancement and Protection) grant to develop the property. The development plan includes restoration of the prairie and woodland areas, installation of trails, a pedestrian bridge, burying of power lines and pole removal and lighting. The total estimate cost of the project is $201,254. Work will begin in July 2008. Creekside Commons Park is located west of South Front Street across from the new elementary school off Vandello Drive and Sadler Drive. The land for this 17-acre park was donated by property owners Steve and Kathryn Epley in December 2004. The developer has constructing an 8-foot concrete trail on both sides of Muddy Creek. The trail will help tie in the development with the new elementary and junior high school. The southwest corner of the park is large enough for a soccer field or ball diamond. 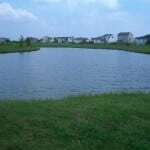 On October 5, 2006 the Parks Department collaborated with the Iowa Department of Natural Resources (DNR) to obtain 500 bluegills and channel catfish to stock the pond that is located on the east side of Sadler Lane. During the summer of 2007 the pond received approximately 100 largemouth Bass. In 2006 North Liberty received a $50,000 playground grant that was used to purchase a new playground structure for this park. The playground structure was installed in July 2008. The remainder of the property includes a significant amount of woodland and wetland areas. The City will be posting designated wetland signs around the area restricting mowing or spraying of any kind to allow the proper wetland seedlings to grow. 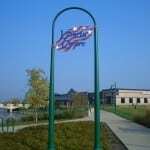 Deerfield Park is North Liberty’s eighth park and opened March 2005 to the public. This 4-acre neighborhood park is located on the north side of North Liberty in the Deerfield subdivision off Fawn Drive. 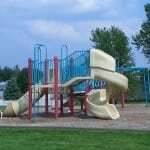 In 2006 North Liberty received a $40,000 playground grant that was used to purchase a new playground structure for this park. The playground structure was installed in the summer of 2007. Goose Lake is located between West Penn street and 240th street just east of the I-380 interchange. It is a 31.34-acre park/pond donated to the City by the Cedar Development Progress Park LLC Developer Scott Anderson. On October 5, 2006 the Parks Department collaborated with the Iowa Department of Natural Resources (DNR) to obtain 2000 bluegills and channel catfish to stock the pond. 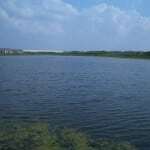 During the summer of 2007 the pond received approximately 300 largemouth Bass. Goose Lake is part of a designated wetland area. The city will be posting designated wetland signs around the pond restricting mowing or spraying of any kind to allow the proper wetland seedlings to grow. The land for this 7.07-acre park, located along Jones Boulevard, was donated by Southgate Subdivision developer, Glenn Siders in October 2000. This park features a large pond and native trees and prairie. The native trees and prairie were planted in 2001 through funds received from Siders and the Million More By 2004 Grant. This park was named through a contest with North Liberty residents submitting suggestions to the Parks and Recreation Commission. The Commission decided on Freedom Park, a suggestion given by residents to honor the victims of the September 11, 2001 terrorist attacks. North Liberty opened its fifth park in the summer of 2000 when a basketball court was placed in the 1.73-acre park, followed by a playground in 2001. 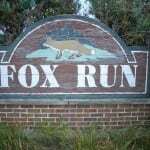 The property, located in the Fox Run Subdivision along Scales Bend Road, was donated by subdivision owner Clair Mekota and residents of the Fox Run Subdivision gathered together to raise funds for the playground equipment and the basketball court. The playground consists of spring rider toys, sand diggers, swing set, chin pull-up bars, tether ball, and a funnel ball. The land for this 6.6- acre park, located on the north side off of Scales Bend Road was donated by the Fox Run Subdivision Developer Clair Mekota to the city in the spring of 2002. Joy’s Park is a 2.50- acre park located west of South Front Street and tucked away at the dead end of Golf View Drive. The land was donated by property owners J.R. and Joy Brumley on December 12, 2006 and the park was named after Joy Brumley. The area is a naturally wooded area and is not accessible to the public by vehicle. At this time it will remain a low maintenance nature area. 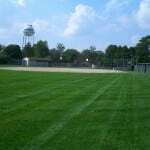 Koser Park became a city park after it was voted to accept the ball field from the Softball Association on July 1, 1968. Koser Park was originally called “City Park” because it was the only park at that time. After Beaver Kreek and Penn Meadows parks were added, the park was usually referred to as “Koser Park” because of its location next to Koser’s General Store and Mort Koser’s involvement in sports in North Liberty. In 1987, after Mort Koser’s death, the park was officially named Koser Park. This 3-acre park is located west of Dubuque Street and Penn Elementary School. Facilities include one youth and adult softball and baseball field and an outdoor basketball court. This $3,042,339 million dollar project was a cooperative effort between the City of North Liberty and several local developers completed in 2006. Liberty Centre, located on the southwest quadrant of the Penn Street and Highway 965 intersection, includes commercial and residential development based around the idea of a cohesive city center. North Liberty enhanced its commercial identity with an exciting park project. New businesses looking to locate in Liberty Centre include a hotel, restaurants and shops. The North Liberty City Council has been working with area builders and business owners to ensure that this project is a magnet for attractive development. 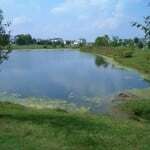 Commercial lots are unified by a comprehensive landscaping plan centered around a large, boulder-lined pond. The Liberty Centre Pond includes scenic features like a waterfall, fountains, pedestrian bridge, fishing pier, pavilion with a small gazebo and extra-wide sidewalks all around the pond. Modeled after the Jordan Creek Mall pond in West Des Moines, this area is a community focal point, just across the road from our magnificent Community Center. An important element of this project design is the pedestrian underpass on Highway 965. This passageway links the Liberty Centre Pond to the east side Highway 965, just steps away from the Community Center, and provides a safe pedestrian connection between the east and west to help unite North Liberty’s expanding community. The City received Community Attraction and Tourism (CAT) funding from the state’s Vision Iowa program to assist with construction of this underpass and trail connections to the project. Liberty Centre, LLC contributed $75,000 toward trails and fountains and have constructed the pond. Libery Centre Pond has been stocked with largemouth bass, bluegills and channel catfish and is now ready for fishing. 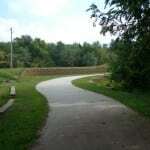 North Liberty opened the Recreational Trail in 1998, and in 1999 the trail was connected to Coralville’s Recreational Trail. This 3.3-mile walking and biking trail begins at the Fox Run subdivision and goes south to Forevergreen Road where it connects to the Coralville trail. The Bike Shelter is located on the trail northeast of the Community Center, and has restrooms, a drinking fountain and picnic tables. Native prairie grass is being established along sections of the Recreational Trail. 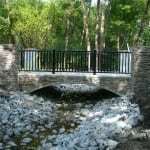 North Liberty expanded the trails system by 3.5 miles in 2006, which includes Liberty Centre Pond, Creekside Commons, North Trail Extension to Fox Run subdivision, and the North Trail addition from Liberty Centre to the Deerfield subdivision. 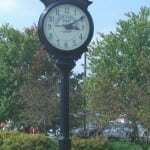 This 0.55-acre park offers a comfortable, small town setting featuring a gazebo and clock. The park is located south of Penn Meadows Park and along Dubuque Street. The ribbon cutting ceremony was held on June 5, 2001. 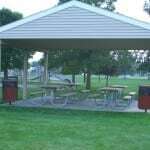 The North Liberty City Band holds concerts in the gazebo, and benches provide a great place to relax and enjoy North Liberty. 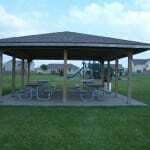 This park is located on a small lot off Parkview Ct. A swing set and picnic table enhance the area. 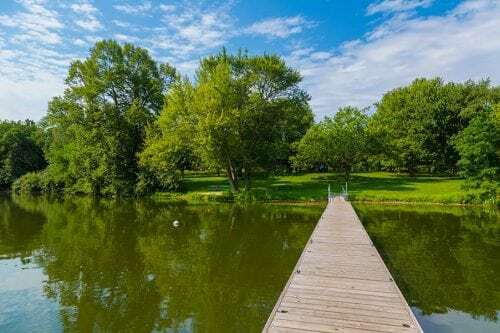 North Liberty’s third and largest park, Penn Meadows Park, received its name from suggestions solicited from North Liberty residents in 1985, and Penn Meadows was selected by the Parks and Recreation Commission. The first 18.7 acres were purchased from Richard and Jeanette Meade in 1983. Additional land and recreation facilities were added with LAWCON grants in 1983, 1984 and 1985. This park is located south of Penn Street and north of Penn Elementary School. This 37-acre park provides excellent recreational opportunities for the entire family. Facilities include picnic shelters for private and group use; Nine youth and adult softball and baseball fields; two soccer fields; playground equipment; volleyball court; new tennis courts; and a pedestrian trail throughout the park. Quail Ridge Park was purchased in 1991. The Parks and Recreation Commission decided to name the park Quail Ridge Park after reviewing suggestions from North Liberty residents. This 10-acre park is located at the west end of Zeller Street. Facilities include a shelter; picnic tables; playground equipment; a baseball and softball batting backstop and basketball court. 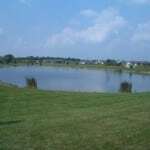 West Lakes is a 48.31- acre park/pond located off of 270th street adjacent to the new Clear Creek/Amana North Bend elementary school. The land was donated to the City by the JDHP Development Developer Jason Harder. On October 5, 2006 the Parks Department collaborated with the Iowa Department of Natural Resources (DNR) to obtain 4,000 bluegills and channel catfish to stock the pond. 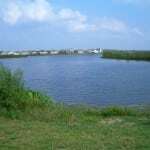 During the summer of 2007 the pond received approximately 550 largemouth Bass. West Lakes is also part of a designated wetland area. The city will be posting designated wetland signs around the pond restricting mowing or spraying of any kind to allow the proper wetland seedlings to grow.